Location: Situated some 300m E of Nanhoron, set back slightly to S of B4413 road, and forming the entrance to the Nanhoron estate. C20 iron entrance gates; Edwardian in style. Off-centre pair of entrance gates, flanked by cast-iron gate piers and gates: piers crowned by urn finials which rest on square domed bases, which are pierced. Urns have lion mask handles and a fret frieze. The fronts of the piers are decorated with a pierced banded frieze and below a design incorporating vertically interlinked ovals and diagonal lines, with plain vertical bars to the base. The railings and top rail curve up to meet the gate piers on either side. 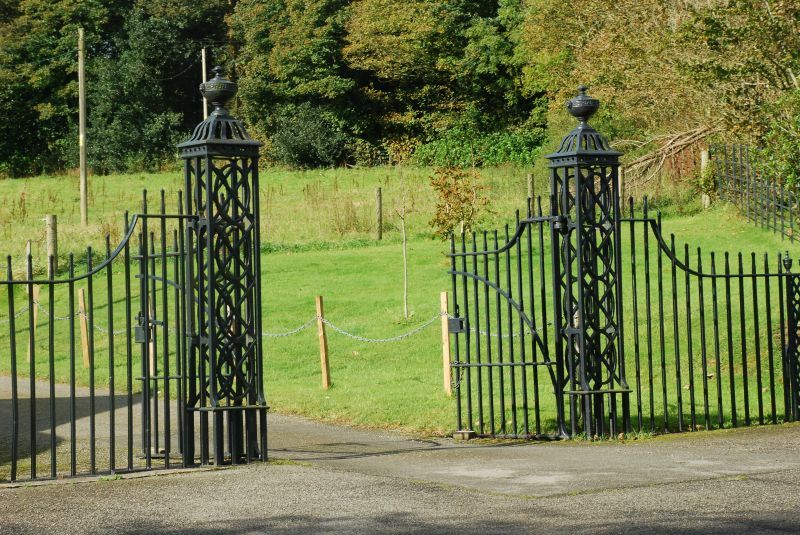 Incorporated in the railings to the left and right of the main gate piers are pairs of smaller flat piers, similarly decorated but with tiny C18 style urn finials; to the E these flank small gate next to entrance lodge. A well-designed and finely detailed set of entrance gates, forming an impressive landmark on the approach to Nanhoron. Situated some 300m E of Nanhoron, S of the B4413 road, in a walled garden next to the entrance gates to Nanhoron estate.